If you haven’t heard of Soap & Glory before, you could be taken for hiding under a rock when it comes to the beauty scene. Soap & Glory (S&G) is a British cult brand that prides itself in making skincare fun and accessible to the every-day consumer, ditching beauty marketing speak and jargon to give results based products (go read my review on their heel genius here. 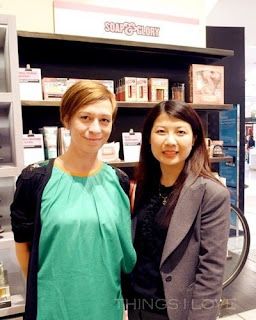 Last month I had the opportunity to interview the marketing brains behind the Soap & Glory, Marie Drago. The French woman has for the past 5 Years made London her home whilest she helps to build the Soap & Glory as a fun, girly and accessible beauty brand. The first thing you will notice when you meet the beautiful Marie is the warmth she exudes and her mesmerising accent. Being French really played to her favour. I hit it off well with Marie and in between discussing holiday plans, nail colours then food and places to visit, I managed to ask her a few question about the brand. Q: How did Soap & Glory get started? A: It was created by Marcia Kilgore who was the founder of Bliss Spa founder back in 2006, while she was on a maternity break. She wanted to create something that was results-based and easily accessible to the consumer so it had to be fun and affordable. She has an aesthetician background and after playing around with making body products, came to create Soap & Glory. Q:What attracts you to S&G? A: I love the fun nature of the brand which is a break away from the traditional skincare brands I’ve worked with in France – they are very much into their scientific based. Soap and glory is different – we are honest and open and have a more informal approach. Our philosophy is that any average person can relate to the brand because it is solution based. We will clearly state what problems your products solve. Q: What are the plans for the company’s growth? A: We are a small company with 25 staff in the UK and approximately a team of 5 in the US. We are going to concentrate on our existing market base and make sure we do well in these areas before considering expansions to newer markets. So that means UK, US, Australia will continue to be our main focus for the foreseeable future. A: Well, I have a secret love for heel genius is the only product in the range that is made in my home country France. I love the Breakfast Scrub from the new range because it smells beautiful with maple syrup, banana and almond for a beautiful scrub to use. I also enjoy Sit Tight which has micro sponge caffeine to helps to tighten and slimming effects – has a warming sensation when you use it as well. Q: Are the differences in what sells better in Australia than in the UK? A: Well there is a smaller range of products in Australia than in the UK – Australia stocks only the best selling skin and body care products. Marie’s tip: apply along the side of calves below the knees to get an extra inch of leg height instantly. Q: So are there any plans to bring the cosmetic range to Australia or any other products? A: Not at this stage, we are concentrating on consolidating on the products we have launched here so far. We don’t spend on marketing or advertising and rely soley on word of mouth and testimonials. In Australia, the brand has just grown so much with Kit Cosmetics’ support. Q: So will you bring out new products to Australia? A: We’ve just brought a few new items like the grapefruit oil hand sanitiser which smells amazing, the breakfast scrub that leaves no residue on the body, the butter yourself body cream which is not as sweetly scented as the Righteous Butter. And for the holiday season, we will see some cute Christmas packs coming out with mini versions of the some fabulous products. Q: What’s an unconventional way you’ve use any S&G products? A: Well I’m told that the righteous butter is very good for stretchmarks and people with eczema use it as a treatment because it is rich in aloe and shea butter. It’s also another of my favourite product. Marie and I then proceeded to discuss food and the best eateries in Melbourne as before wrapping up. It was an immense pleasure to meet and chat with her. I’m grateful she took time out of her busy schedule to meet give me some time for this interview and I hope you learned something new about the Soap & Glory Brand.